Maybe you’re considering going off grid because you don’t want to be tied to dependence on government utilities and corporate food sources. Maybe you want to go off grid because you’re hoping that it can save you money. Maybe you want to go off grid because you relish the idea of being truly independent. Maybe you relish what you think will be a challenge. And maybe you just want to know how to do it so that you can survive when the SHTF. Plants can’t grow where there is no soil. In other words, make sure that the land which you are homesteading has soil that will grow food or get to work on making it work for that purpose. Water runs downhill. Access water sources uphill from you to utilize gravity to assist in providing water pressure. Carrying water is awful. “It’s back breaking labor.” Whatever you have to do to get your plumbing underground and prevent freezing in winter is worth doing. Batteries run out. Find ways to recharge or other power sources. Bears like trash. They will visit and may even move into your area. Secure your trash so bears have no incentive to hang out. Firewood is a lot of work. Rocket mass heaters are worth considering. 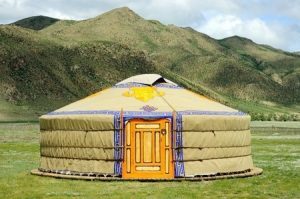 Yurts are better for cold weather than hot weather. A fan can do wonders. Temporary is longer than you think. Plan for it to take longer than you think so that you can handle the extended period of time that the work takes. You can do things that you didn’t know that you could do. What are your suggestions for living off grid? Tell us below.